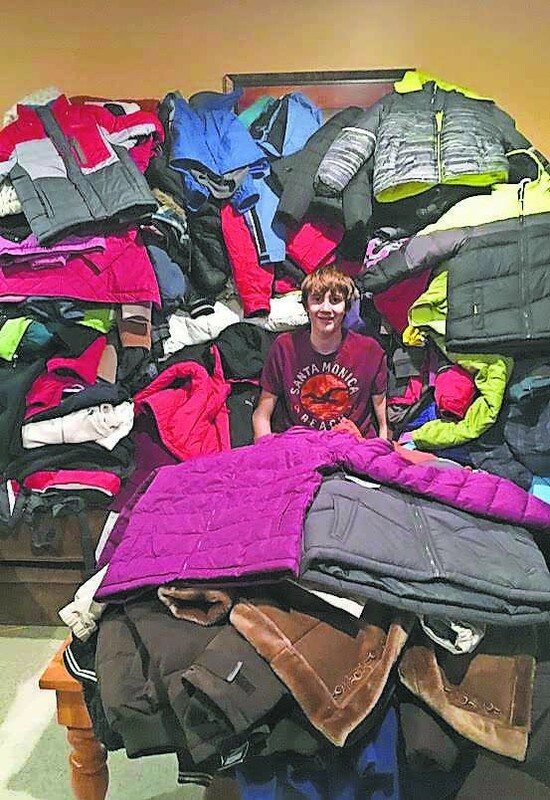 Thirteen-year-old AJ Eichmann expected to raise 50 coats, but he ended up with 300. Burlington Township Middle School eighth grader AJ Eichmann held a coat drive for the holiday season and collected more than 300 coats. Eichmann originally set his goal at 50 coats, but quickly surpassed it. Eichmann said to get the word out about his coat drive, he used emails, Facebook and simple word of mouth communication, which had people Eichmann didn’t even know coming to his house to drop off coats. Eichmann did the coat drive as his confirmation community service project at Sacred Heart. While he says he’s always had a passion for helping others, this was the first big project he organized himself. While Eichmann organized the event himself, he says he couldn’t have made it happen without the help of his family. His dad and sister advertised the coat drive at their offices, and his mom helped spread the word wherever and whenever she could. Eichmann’s mom, Sue, says the whole family is incredibly proud of AJ. Sue added she is also extremely proud of the community for rallying together and donating as much as it did, adding some people brought bags of 20 coats or more to the Eichmann house to donate. “It was really touching to see the way our community came together. I think we all learned a really powerful lesson of how kind and generous people can be,” Sue said. Eichmann donated the coats to both Ladles of Love and the Society of St Vincent de Paul. Ladles of Love is a soup kitchen in Burlington City held out of St. Mary’s Episcopal Church. The kitchen is open every Wednesday and generally serves more than 150 people each week. Ladles of Love told the Eichmanns that AJ’s donation was the biggest it had ever gotten. The Society of St. Vincent de Paul is part of Sacred Heart. Eichmann had the opportunity to help hand out the coats with the society, which he really enjoyed. Sue says it was touching to see the people AJ was helping. Eichmann contributes his success with the coat drive to a genuine desire to help others. “There are people who are (less fortunate) than we are, and we have to help them. Everyone has to work together to help each other,” Eichmann said, adding he thinks other members of the community feel the same way. “People naturally want to help other people. When they get an opportunity, people jump on it,” Eichmann said. Eichmann is planning to do another fundraiser next year, though he’s not sure whether it’ll be another coat drive. Eichmann’s message to anyone who wants to do a fundraiser is to stick with it and never give up. “I thought we would only end up with 50 coats, but here we ended up with 300. I’m glad we saw it through until the end,” Eichmann said.